The newest addition to our collection of fruit bouquets is the sweetest way to congratulate parents on the arrival of their newborn babies. 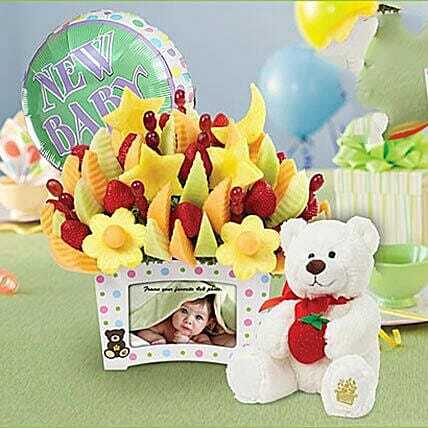 The New First Moments Bouquet features a fresh fruit assortment consisting of strawberries, grapes, cantaloupe, honeydew and adorable pineapple shapes such as moons, stars, and daisies. It is an artistic arrangement that is placed inside the keepsake container that holds a 4x6 photo. The container colour may vary and will be either green or white.